By NRA Video: Cam Edwards talks to NRA Past President Marion Hammer about Gun Rights in Florida where pediatricians and general practitioners are asking and lecturing people that guns are bad and giving false statistics to people. Promoting a political position that guns should be banned in Florida. Emergency Room personnel are asking people coming into the emergency room if they person owns a gun or if there are guns in a home. Marion Hammer, executive director of Unified Sportsmen of Florida and a former National Rifle Association president, said she knows some parents are offended because "a number of them" have complained to her organization. The legislative initiative traces its roots to a publicized fracas last year in which an Ocala-area physician told a couple to find another pediatrician after they refused to disclose whether they had a gun. "You have a right to seek medical care without being interrogated about the private property that you own," Hammer said. The pending bill in the Florida Legislature would also make it illegal to note a patient's gun ownership status on a medical record. Tags: NRA, NRA ILA, NRA News, Florida, guns, firearms, gun control, gun rights, Second Amendment, doctors, banning guns, Cam Edwards, Marion Hammer, Concealed Carry, privacy rights To share or post to your site, click on "Post Link". Please mention / link to America's Best Choice. Thanks! Posted by Bill Smith : Post Link --> 3:22 PM 0 Comments - Share Yours! The University of Central Florida has allowed a radical Muslim imam to speak on campus--even though he was an unindicted coconspirator in the 1993 WTC bombing! by Marc Schenker: Florida university lets imam who was involved with ’93 WTC bombing speak. A radical Muslim imam who was named as an unindicted coconspirator in the 1993 WTC bombing spoke . . . at the University of Central Florida, a guest of the Muslim Student Association’s Islam Awareness Month celebrations. Despite complaints all week long, UCF did not ban the terror-supporting imam from speaking and instead bowed down to the pressure from its Muslim Student Association and its schedule of events for this month. Imam Siraj Wahhaj is an African-American convert to Islam, who has been criticized repeatedly for beinga hatemonger who tries to radicalize African-American youth by pushing radical Islamic ideology onto them. The irony—or perhaps it is the sheer arrogance and elitism of some Muslims—is that the Muslim Student Association who invited him claims that his speaking engagement was intended to dispel misunderstandings about Islam. That aim was completely undermined and defeated at Wahhaj’s speaking engagement last night because his history reads like a textbook case ofIslamic extremism and radicalism. I guess this also indicates that to some Muslims—like the students who invited this anti-American democracy instigator—what makes an imam radical to you and me is simply “normal” for their community. Wahhaj is actually a black American born as Jeffrey Kearse in Brooklyn, New York. He is currently the imam at Brooklyn’s Al-Taqwa mosque. His track record reads like someone who you would take to be the epitome of Islamofascism, though. In a 2003 Wall Street Journal story, Wahhaj was exposed as an imam who would indoctrinate his black followers in the inner city with allegations that the CIA and the FBI were the true terrorists. . . . But the most disturbing aspect by far of this American-born, radical Islamist’s actions is his involvement in the 1993 WTC bombing. Around that time, he was named by US Attorney Mary Jo White as an unindicted coconspirator in the bombing. Wahhaj was even a character witness for Omar Abdel-Rahman, or the Blind Sheikh, meaning he spoke of the apparently “good” qualities of this terror conspirator, who is now sitting in federal prison for seditious conspiracy against the US. Tags: University of Central Florida, Islam Awareness Month, radical Imam, Siraj Wahhaj speaker, coconspiritor, World Trade Center Bombing To share or post to your site, click on "Post Link". Please mention / link to America's Best Choice. Thanks! Posted by Bill Smith : Post Link --> 10:41 PM 0 Comments - Share Yours! GOP Weekly Address: In the Weekly Republican Address, Sen. 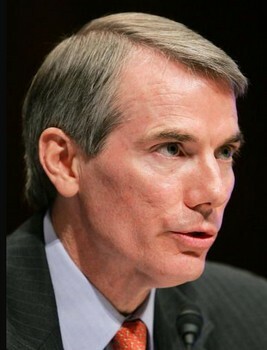 Rob Portman of Ohio and former Bush White House Budget Director says, "We've had to relearn the lesson we all know in our hearts: you can't spend your way to prosperity. As American families have tightened their belts over the past couple of years and businesses have had to do more with less, the federal government has taken the opposite path, spending more, growing bigger, and becoming more involved in our economy and our lives. This historic failure to control spending directly affects our economy and the ability to create jobs." "There is an urgency about this that the American people get even while many in Washington seem to be in denial. We must rise to the challenge and work together to meet our economic and fiscal problems head-on by putting in place pro-growth measures and spending restraint and we must do it now." Sen. Portman expresses his disappointment that Democrats in Washington still don't seem to understand this. "Having chosen to duck the tough choices for the coming year and beyond, the President and Democrats in Congress are now objecting to any reductions in spending Congress can control in the current budget year. This is despite the fact that this year's $1.6 trillion deficit is at record levels, and over the past two years under Democrat leadership, this type of spending has increased 24 percent, and over 80 percent if you include the Stimulus. Our goal as Republicans is to make sensible reductions in this spending and create a better environment for job growth, not to shutdown the government. Getting our debt and deficits under control is the first step we can take, and the single most important step Washington can take, to get our economy moving and create the jobs we so badly need." Tags: US Senator, Rob Portman, Ohio, Republican former OMB Director, Address, response, White House, Barack Obama, Congress, Government, deficit, debt, budget spending, economy, jobs, taxes, fiscal commission To share or post to your site, click on "Post Link". Please mention / link to America's Best Choice. Thanks! Posted by Bill Smith : Post Link --> 4:43 PM 0 Comments - Share Yours! 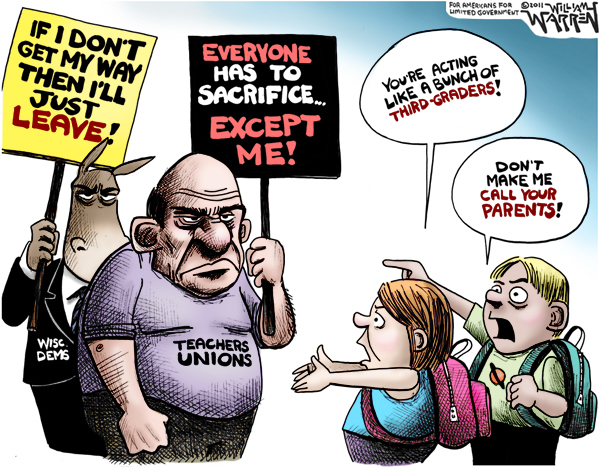 by William Warren: Today’s cartoon focuses on the Wisconsin (and now also Indiana) Democrats and the Teachers Unions…two groups that are acting like selfish, immature third-graders. Tags: Democrats, Political Cartoons, Senate Democrats Flee State, Teachers Unions Act Like Third Graders, William Warren, Wisconsin, Wisconsin Teachers Unions To share or post to your site, click on "Post Link". Please mention / link to America's Best Choice. Thanks! Posted by Bill Smith : Post Link --> 1:52 PM 0 Comments - Share Yours! by Ralph Benko: Why are so many state legislators beginning to call for issuance of a form of gold money? The Constitution prohibits states from coining money but allows them make “gold and silver Coin a Tender in Payment of Debts….” By prohibiting everything except “gold and silver Coin” the Constitution clearly contemplates this as legitimate. Legislators in a dozen states are looking at legislation about gold or silver-based currency, including, right now, Utah, South Carolina, Virginia and New Hampshire. States haven’t issued money for over a hundred years. So … why now? There is disgust by state legislators with the federal government’s promiscuously printing money. This reflects the views of those who wrote and adopted the United States Constitution. The transcript of the debates in the original Constitutional Convention shows the attitude of the Founders toward paper money was one of disgust. In debate one delegate, Roger Sherman, called for the insertion of an absolute prohibition against states issuing their own paper money. Mr. Sherman thought this a "favourable" crisis for crushing paper money. The Founders voted to adopt Sherman’s “crushing” of state-based paper money. Mr. Elsesworth thought this a favorable moment to shut and bar the door against paper money. The mischiefs of the various experiments which had been made, were now fresh in the public mind and had excited the disgust of all the respectable part of America. By withholding the power from the new Government, more friends of influence would be gained to it than by almost any thing else. Paper money can in no case be necessary. Give the Government credit, and other resources will offer. The power may do harm, never good. Those who wrote the Constitution decisively stripped the federal government of the power to issue inconvertible paper money. And stripped it stayed… until, temporarily, during the Civil War. Saving the Union was of transcendent importance. A strong constitutional argument exists for the legitimacy of paper money as an expedient. But it set a bad precedent. For most of American history dollars were convertible into gold or sometimes silver. It is a 20th century innovation to have inconvertible money. FDR suspended domestic convertibility. And then… Richard Nixon’s 1971 suspension of the convertibility of the dollar into gold put the final nail into the dollar’s coffin. President Nixon announced this as a temporary suspension. “I have directed Secretary Connally to suspend temporarily the convertibility of the dollar into gold …. Well. The dollar today is worth less than a quarter was worth in 1971. The American people are patient but we are not stupid. We have noticed the steady erosion of the dollar’s buying power, that fact that our dollars are worth 80% less than the day of “the Nixon shock.” We have noted the bankruptcy of the assurances we were given. Yet Washington has been curiously unresponsive to the suffering brought by its failed promise. Why? Washington has itself been a primary beneficiary of monetary depreciation. The federal government spent $15 billion from 1789 – 1900. Not $15 billion a year. $15 billion cumulatively. Uncle Sam will spend $10 billion a day in 2011. The federal government spends more every two days than it did altogether for more than America’s first century. Although these sums are not adjusted for inflation they give a correct impression of the magnitude of the change from what our Founders set forth and our early statesmen delivered. How does Washington get its hands on so much money? Three ways. Taxing us, on which it is maxed out. Borrowing — deficits — to which there is a growing massive resistance. And there is a third and even more pernicious way: printing dollars. Washington prints money – such as Chairman Bernanke’s massive $800B+ “quantitative easing.” Wildly printing money erodes the value of the dollar. It will damage every American’s hard-earned savings. The power to print money at whim is wrong. It is toxic to our personal and national wellbeing. So legislators in twelve states are exploring gold-based currency. It is reprehensible for national elites to deride those who are doing so. Whatever objections one might have to the mechanisms being considered the impulse is legitimate and even noble. State legislators are challenging the federal abuse of an unconstitutional power, challenging the issuance of unhinged paper money. Federal officials should take these state initiatives as a cue. Federal officials have sworn to preserve, protect and defend the Constitution of the United States. Let them take their oath seriously and restore the convertibility of dollars to gold. Tags: Commodities, Gold, Taxes, Politics, Government, Federal Budget, U.S., Debt, Economy, Ralph Benko To share or post to your site, click on "Post Link". Please mention / link to America's Best Choice. Thanks! Posted by Bill Smith : Post Link --> 1:56 PM 0 Comments - Share Yours! Tags: Wisconsin, protest, Gov. Scott Walker, SEIU, union, teachers, budget, spending, collective bargaining To share or post to your site, click on "Post Link". Please mention / link to America's Best Choice. Thanks! Posted by Bill Smith : Post Link --> 6:48 PM 0 Comments - Share Yours! Come hear from your Congressman on the important issues in Washington and be prepared to voice your concerns, issues and suggestions. Tags: Congressman, Allen West, Florida, Townhall To share or post to your site, click on "Post Link". Please mention / link to America's Best Choice. Thanks! Posted by Bill Smith : Post Link --> 9:09 PM 0 Comments - Share Yours! Feb 16th 2011; Tallahassee,Fla. 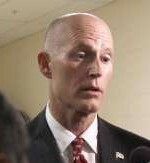 – After thoughtful consideration, Governor Rick Scott informed U.S. Transportation Secretary Ray LaHood of the state’s decision to reject President Obama’s Tampa to Orlando high-speed rail project. As you know, I was elected to get Floridians back to work and to change the way government does business in our state. I am committed to making good on those promises. Recently, I sent a budget proposal to the legislature that reduces the size and scope of government; reduces the costs of that government and passes those cost savings on to taxpayers so that we can create new jobs and turn Florida’s economy around. I believe when you reduce government’s reach and hold that government accountable, you create an environment where the economy can flourish. As you know, my background is in business, not politics. But you don’t have to be an economics expert to understand that if you spend more money than you take in, your business will fail. Unfortunately, politicians haven’t always seemed to grasp that same principle. In fact, the Obama administration just announced a $3.73 trillion budget that includes the largest budget deficit in our nation’s history ($1.65 trillion). The president’s budget includes $1.6 trillion in higher taxes. Those higher taxes will impact Floridians and our competitiveness worldwide. 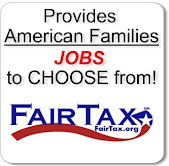 We cannot expect individuals to build businesses in America if our taxes are higher than other countries. Higher taxes and more government spending is a recipe for disaster. Government has become addicted to spending beyond its means and we cannot continue this flawed policy. Let us never forget, whether it is Washington or Tallahassee, government has no resources of its own. Government can only give to us what it has previously taken from us. That is why today I am announcing my decision to reject the Obama administration’s plan to partially-fund the costly Tampa to Orlando high-speed rail project. Moments ago I spoke with U.S. Transportation Secretary Ray LaHood to inform him of my decision. I appreciate the Secretary’s efforts to work with us and I look forward to working with him in the future. o First – capital cost overruns from the project could put Florida taxpayers on the hook for an additional $3 billion. o Second – ridership and revenue projections are historically overly-optimistic and would likely result in ongoing subsidies that state taxpayers would have to incur. (from $300 million – $575 million over 10 years) – Note: The state subsidizes Tri-Rail $34.6 million a year while passenger revenues covers only $10.4 million of the $64 million annual operating budget. o Finally – if the project becomes too costly for taxpayers and is shut down, the state would have to return the $2.4 billion in federal funds to D.C. The truth is that this project would be far too costly to taxpayers and I believe the risk far outweighs the benefits. Historical data shows capital cost overruns are pervasive in 9 out of 10 high speed rail projects and that 2/3 of those projects inflated ridership projections by an average of 65 percent of actual patronage. It is projected that 3.07 million people will use the train annually. Keep in mind that Amtrak’s Acela train in Washington, D.C., Boston, Philadelphia, New York and Baltimore only had 3.2 million riders in 2010. And that market’s population is 8 times the size of the Tampa/Orlando market. President Obama’s high-speed rail program is not the answer to Florida’s economic recovery. We must make investments in areas where we will get a return for the shareholders – Florida’s taxpayers. Rather than investing in a high-risk rail project, we should be focusing on improving our ports, rail and highway infrastructure to be in a position to attract the increased shipping that will result when the Panama Canal is expanded when the free trade agreements with Colombia and Panama are ratified and with the expansion of the economies of Central and South America. By capturing a larger share of containerized imports entering our seaports, expanding export markets for Florida businesses and emerging as a global hub for trade and investment we can create up to an additional 143,000 jobs according to a recent chamber of commerce study. It is absolutely critical that we make smart investments with taxpayer dollars, whether state or federal, and I believe our state will be better served by spending these funds on projects that will benefit Florida and not turn into a spending boondoggle. The answer is to reduce government spending, cut government’s leash on our state’s job creators and then hold that government accountable for the investments it makes. That is what I was elected to do and that is how I plan to govern. Let’s get to work! Tags: Florida, Governor, Rick Scott, high speed rail To share or post to your site, click on "Post Link". Please mention / link to America's Best Choice. Thanks! Posted by Bill Smith : Post Link --> 2:10 PM 0 Comments - Share Yours! by William Warren: Now that the Super Bowl is over, the “other” Super Bowl begins–the battle between the NFL and the NFLPA. While American suffer through the biggest "super bowl" of their lives. How Much New Debt is Being Proposed By Obama? It is is larger than the total amount of debt accumulated by the federal government from 1789 until January 20, 2009. Gasp!! Catch your breath yet! Let's look at some facts detailed by the Republican Study Committee:Third and Fourth Trillion-Dollar Deficits in a Row: The President’s budget proposes a $1.65 trillion deficit in FY 2011, and then a $1.1 trillion deficit in FY 2012. This follows a $1.29 trillion deficit in FY 2010, a record-breaking $1.41 trillion deficit in FY 2009, which followed a then record-breaking $459 billion deficit in FY 2008. 28.0% Spending Increase Since 2008: Federal spending has increased from $2.98 trillion in FY 2008 to a proposed $3.82 trillion in FY 2011. This is an increase of $836 billion or 28.0%. Annual Deficits Turn Into Monthly Deficits: In the four years of budgets under the control of a Democrat Congress (FY 08-11), deficit spending will amount to $4.8 trillion. By contrast, it took twelve years (FY 96-07) for the previous Republican Congress to create total deficits of $1.2 trillion. The annual deficits under the previous Republican Congress (FY 96-07) became monthly deficits under the Democrat Congress (FY 08-11). Democrat Congress Record on Deficits—From Projected $800 Billion Surplus to $9.2 Trillion Deficits: The same month Democrats took control of Congress (January 2007), CBO projected an $800 billion surplus over the ten-year period FY2008-2017. Today, covering the same period—including the actual deficits from FY 2008-2010—as well as what the President proposes in his budget for fiscal years 2011 through 2017, that $800 billion surplus turns into a $9.2 trillion deficit. This is a $10 trillion worsening of the budget outlook in four years of Democrat control of the Congress. This is the budget picture the 112th Congress inherits.Read the entire brief. It’s full of bad news, but good to know. To fight the cancer we need to address the source of the problem. Don't get sidetracked by the pundits and liberal rhetoric. they are trying to distract the public from the truth. The enemy is big government spending which is now in overdrive by arrogant progressive leadership of the Obama administration. 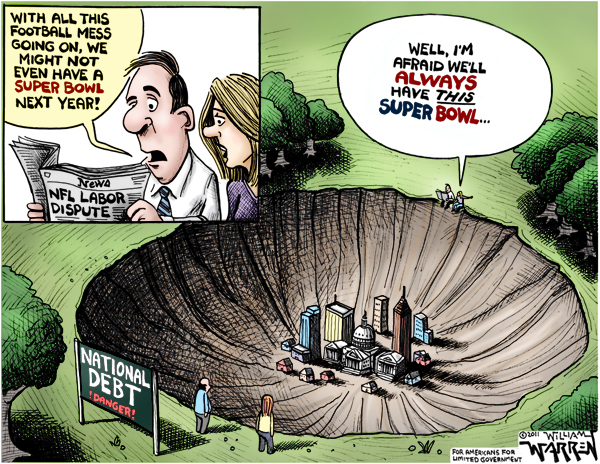 Tags: National Debt, NFL, NFL 2011 Lockout, NFL Labor Dispute, NFLPA, Political Cartoons, Super Bowl, Super Debt, William Warren, Republican Study Committee, big government spending, Obama administration, To share or post to your site, click on "Post Link". Please mention / link to America's Best Choice. Thanks! Posted by Bill Smith : Post Link --> 1:11 PM 0 Comments - Share Yours! "Despite the ruling of a federal court striking down the bill in its entirety, the Obama Administration has continued with the regulatory implementation of the health care takeover. Instead of the rule of law, we now have the rule of Obama. "Today, published in the Federal Register, the Obama Administration has introduced a new regulation affecting student health plans. The problem is that the executive branch has no power to implement regulations based on voided legislation. These actions are barred by Judge Vinson's ruling. The Obama Administration has not even taken the basic step asking the courts for a stay of that decision. "This lawlessness must not stand. Without a stay or being overturned, the Administration must follow Judge Vinson's decision. "It is now evident that the Department of Health and Human Service is taking further steps to execute the law expressly forbidden by Judge Vinson's ruling. 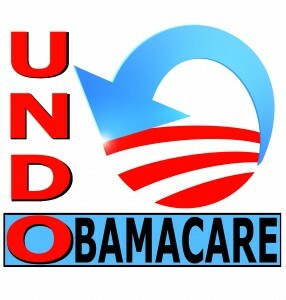 Obama has called the states' bluff by continuing with implementation. 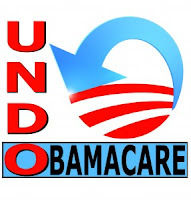 If the states are serious in their opposition to ObamaCare, they must take immediate action." This is where the rubber meets the road for the states. Let's encourage Florida Attorney General Pam Bondi to take immediate action against the new ObamaCare regulations being implemented by returning to court. The Obama Administration is simply ignoring the ruling. It hasn't appealed it or sought a stay. It is just doing as it pleases. That's not the rule of law. The courts cannot act on their own, however, the states need to ask that they intervene. Also, if you have not already done so, please go to KeepThePledge.org to urge House Republicans to keep their pledge to cut $100 billion in spending immediately. House Republicans need to keep their pledge, Obama struggles to articulate his Egyptian policy, a court rules that penguins (which don't live in the U.S.) are protected under the Endangered Species Act, and why progressives are arrogant. "They have a myriad of areas where funds could be cut and would not affect the running of the country. For example we should cut off the UN, we should end the Department of Energy, all funding to the arts and public air ways. The list goes on and on. Why are they having such a difficult time doing such a simple task? It is a quite disheartening." I'm with you, Gary. When the current deficit is $1.5 trillion, cutting $100 billion only represents 6.6 percent of the problem. They're going to have to do this 15 more times just to get to a balanced budget. And you mention very important things that should be cut, but don't forget that the things you're mentioning are just non-defense discretionary spending. The parts that need to be cut is mandatory spending, which is over $2 trillion a year. Tags: Robert Romano, ALG News, Obama Administration, court ruling, ObamaCare, defies court, implements regulation, Florida, AG, Pam Bondi To share or post to your site, click on "Post Link". H/T to ARRA News Service. Thanks! Posted by Bill Smith : Post Link --> 9:25 PM 1 Comments - Share Yours! Congratulations Javier!! Javier Manjarres, The Shark Tank (FL) has been named CPAC 2011 Blogger of the Year. He is a great great blogger & investigator often quoted here on America's Best Choice. Tags: Duane Lester, interview, video, Javier Manjarres, CPAC, 2011 CPAC To share or post to your site, click on "Post Link". Please mention / link to America's Best Choice. Thanks! Posted by Bill Smith : Post Link --> 11:25 AM 0 Comments - Share Yours! "Governor Rick Scott's proposal to move Medicaid recipients into managed care plans could save as much as $2 billion a year and is a move that warrants consideration by all governors and legislatures across the country. Medicaid spending is already sinking state governments with $60 billion in annual obligations that are set to dramatically rise as temporary federal 'stimulus' moneys run out. After that, state Medicaid spending will only rise in the next 10 years. This is a program that must be scaled back if states are to get their fiscal houses in order. Governor Scott is to be applauded for taking this step. "Governor Scott also plans to put new government employees into a 401(k)-style retirement system and for all government employees to contribute 5 percent of their salaries to retirement. This will likely save another $1.4 billion every year, and give public employees a greater stake in the solvency of their retirement funds. And by transitioning new employees into defined contribution plans, Florida is putting itself on sounder fiscal footing for the coming years. With unfunded pension liabilities for states totaling as much as $3 trillion, phasing out and eventually eliminating defined benefit plans must be at the top of every state's long-term fiscal planning. There is too much at stake. "Thanks to these remarkable steps by Governor Scott to slash state spending, he can afford to include in his plan $2 billion in property and corporate tax cuts. These will make it easier for Florida to clear out its excess housing stock, and add new incentives for businesses to set up shop there. "Taken together, slashing Medicaid spending, reforming the public pension system, and reducing the tax burden are a model for every state in the Union to follow. These are the steps that must be taken to make America competitive again, and to save governments from certain insolvency." Tags: Florida, Governor, Rick Scott, Medicaid, pensions, Overhaul, Bill Wilson, Americans for Limited Government To share or post to your site, click on "Post Link". Please mention / link to America's Best Choice. Thanks! Posted by Bill Smith : Post Link --> 3:41 PM 0 Comments - Share Yours! Tags: Bob Parks, commentary, Black History Month, history, blacks, democrats, republicans H/T ARRA News Service. To share or post to your site, click on "Post Link". Please mention / link to America's Best Choice. Thanks! Posted by Bill Smith : Post Link --> 10:55 PM 0 Comments - Share Yours! Vows to replace current law with real reformWASHINGTON – Congressman Tim Griffin (R-AR-02) today issued the following statement in response to a second federal court ruling that the individual mandate, requiring Americans to carry insurance or pay a penalty, found in the Obama health care law violates the Constitution: "I welcome the ruling in favor of the 26 states that sued the federal government over the constitutionality of the health care law. I voted to repeal the law earlier this month, and I look forward to continuing the process in the House to replace it with a new one that increases access, lowers costs, limits government, promotes job creation and follows the Constitution." Arkansas Republicans Applauds Florida Ruling on Obamacare MandateLittle Rock, Ark – A Florida federal judge ruled today in favor of a twenty-six state lawsuit claiming the provision in the President’s health care law requiring every American to purchase health insurance is unconstitutional. Unfortunately for Arkansas, Attorney General Dustin McDaniel and Governor Mike Beebe believe the individual mandate to be constitutional and support its’ implementation. Americans for Limited Government RespondsFairfax, VA — Bill Wilson, President of Americans for Limited Government: "For the second time, the federal courts have ruled that the federal government's takeover of the health care system is unconstitutional. Congress needs to act now to defund the regulation writing on this unconstitutional law to prevent further damage from being done to our nation's health care system. It is clear with a majority of states suing to stop the law, that it is unpopular, unconstitutional and unenforceable. Congress needs to act now to correct this mistake. "With all Americans increasingly concerned about the unsustainable debt Obama and his cohorts have imposed on taxpayers, stopping any further advance of ObamaCare is vital to getting our fiscal house in order. First, stop any further regulation or dictates to the states. Second, repeal the law outright. And finally, move with common sense, market-based proposals to make the necessary repairs. Judge Vinson, following the ruling by Judge Hudson, has done a great service to the American people by beginning this crucial process." "But Judge Vinson's ruling is not a fatal blow to ObamaCare. The administration is certain to appeal, and the judge did not issue an injunction against the continued implementation of the law. Nevertheless, his opinion should bolster the determination of Senate Republicans to force a vote on repealing ObamaCare while the case works its way to the Supreme Court." Tags: Federal healthcare law, Obamacare, Judges ruling, unconstitutional, responses, US Senate, US House, Arkansas, republicans, Gary Bauer, Bill Wilson, RPA, Tim Griffin. House Speaker, John Boehner, Mitch McConnell, H/T ARRA News Service. To share or post to your site, click on "Post Link". Please mention / link to America's Best Choice. Thanks! Posted by Bill Smith : Post Link --> 10:10 AM 0 Comments - Share Yours!